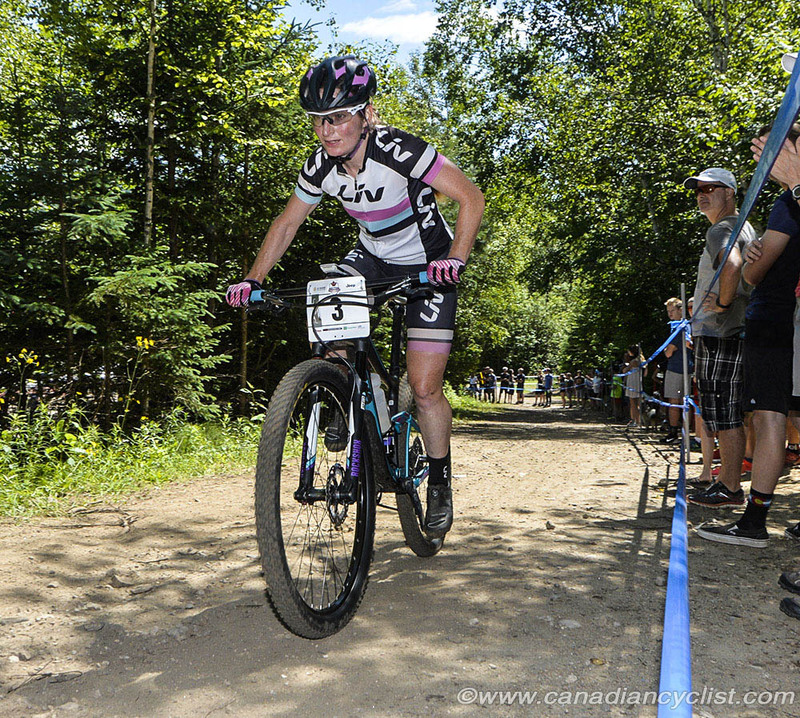 Round 5 of the XCO Canada Cup series saw Sandra Walter (Liv Giant) and Andrew L'Esperance (Norco Factory Team) takes wins in Saint-Félicien, Quebec, on Saturday. Saint-Félicien is a rugged technical course, demanding skill and endurance to do well, it has been the site of both national championships and a World Cup. Walter, who a week earlier was a silver medalist at the national championships, won the five laps Elite Women's race with a time of one hour, 30 minutes and 12 seconds, finishing one minute and 36 seconds ahead of Haley Smith (Noro Factory Team). Cindy Montambault (Trek GPL) was third, a further 23 seconds back. The top Under-23 rider was national champion Catharine Fleury (Cyclone d'Alma), in fourth overall. In the Junior Expert category, Sophianne Samson (Sigma Assurance) was the winner. Emily Batty (Trek Factory Racing) continues to lead the standings with two wins and a second place, despite missing St-Felicien as she prepares for the Rio Olympic Games. However, Batty's 575 points is only five ahead of Montambault, with American rider Jena Greaser (Women's Pedal Project) a further ten points behind. Florence Dostie-Ménard (CVM de la Gatineau) is the top Under-23 rider, in sixth place overall. National champion Emily Handford (Rocky Mountain Factory) continues to lead the Junior Expert standings, with 370 points to Samson's 340. L'Esperance won a close battle with two of his Norco factory team mates in the Elite Men's six lap race, finishing with a time of one hour, 31 minutes and 27 seconds. Only one second back was Evan Guthrie, and a further 0.413 of a second behind was Evan McNeely. The top Under-23 rider was National Championships silver medalist Marc-André Fortier (Independent) in sixth place overall. In the Junior Expert category, Felix Longpré (Club Cycliste MSA) was the winner. McNeely continues to lead the overall standings, with 770 points. He is followed by three Norco Factory team mates - L'Esperance (710 points), Guthrie (650 points) and Peter Disera, the top Under-23 rider in fourth, at 565 points. In the Junior Expert category, Quinton Disera (Team Ontario/Angry Johnny's p/b Norco & Garneau) continues to lead with 385 points, followed by Longpré at 290 points. 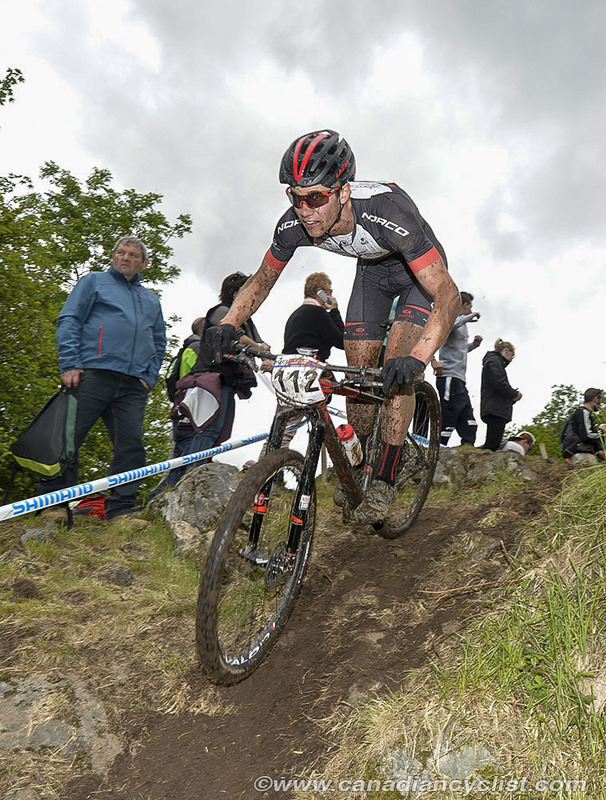 The Canada Cup XCO series concludes in Whistler, BC on August 19th.